We just celebrated the first day of autumn! Whether it’s still 90 degrees where you are, or the leaves are already crunching underfoot, it’s important to remember that winter will be here sooner than we expect it to be. 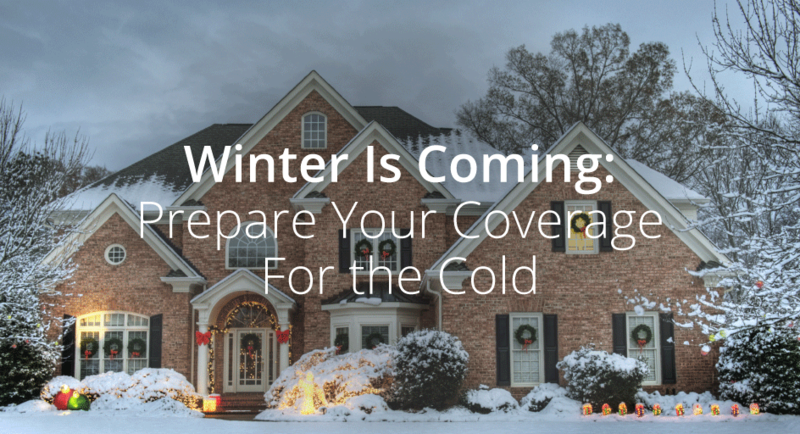 And while some of us look forward to the cold and others dread it, we all have something in common as long as we own a home and belongings: our insurance policies need to be in order before the cold weather hits. If the warm summer weather made you want to roll up your sleeves and make improvements to your house, then you’ll want to reexamine your insurance policy before the winter hits. Depending on what kind of improvement you made, the addition to your home may not be covered under your existing policy. Before the renovation has to stand up against its first winter, check with your agent and make sure your costly project is protected with the right coverage. With an uptick in holiday travel, dreary weather, freezing temperatures, and earlier nightfall, it’s no surprise that car accidents are more likely to occur in the winter. Before the weather takes a turn for the worse, check in on your auto policy and make sure your coverage is ready to handle claims for liability and collision. While you’re checking up on your automobile coverage, consider checking in on the boat or RV insurance policies, too. If you usually discontinue or downgrade your summer fun policies in the winter, make sure these vehicles are secured from theft and fire as much as possible. Talk to your agent about where you store your boat or RV for the summer, and see what your biggest risk factors are. Summer vacations are a great opportunity to load up on keepsakes, souvenirs, and decor. If your trip this year included purchases like exotic artwork, antiques, jewelry, or something else, you’ll want to use this fall season to check your personal property policy and make sure it has enough coverage to protect these new, one-of-a-kind items. Having a lot of property to protect is quite a responsibility, but it is always worth it when something goes wrong. We’re here to help take the stress out of that responsibility, and ensure you’re properly covered all year round. Give Carnal Roberts Insurance Agency a call to go over your policies this fall, so you can cozy up stress-free when winter rolls around.